To Dog With Love: #SuperDogSunday Viewing Guide: Get Your Dog in the Game! 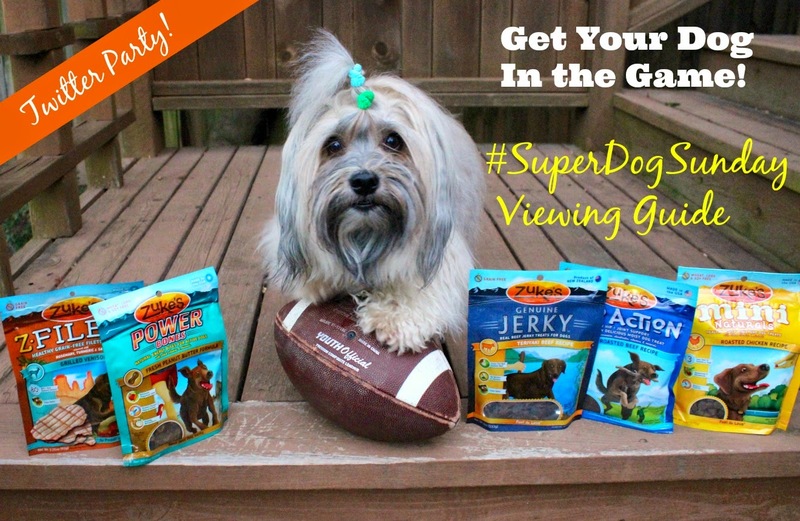 #SuperDogSunday Viewing Guide: Get Your Dog in the Game! 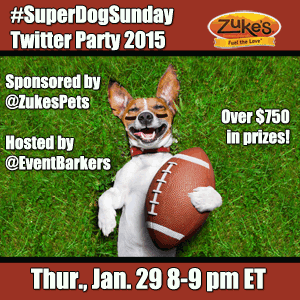 Here's your viewing guide for the #SuperDogSunday Twitter Party this Thursday, January 29 from 8 - 9 p.m. ET. We hope you'll join us for lots of fun and prizes from Zuke's and great tips on how to get your pups game day ready with plenty of activities for a doggone good day! Here's what you need to know to participate and enjoy the fun. RSVP for the #SuperDogSunday party. Even if you can’t attend Thursday night, you can enter to win a pre-party prize package from Zuke's! Pick out some photos of your dogs to share during the party! Sharing a photo or any kind of engagement will enter you to win prizes! Bring your own tips for getting your own dog game day ready. We'd love to hear them. And we'll be sharing ours, too. Mark your calendar for the Thursday party from 8 - 9 p.m. ET…see you there! Why: To celebrate how we get our dogs in the game -- activities for a doggone good day! Prizes: $750+ in prizes from Zuke's. Here’s a rundown of all the prizes. Just head on over to #SuperDogSunday on Twitter at party time and say hi! Simply participate in the party to be eligible to win prizes. You can engage in conversation or share photos of your pets -- but, whatever you do, be sure you use the #SuperDogSunday hashtag on all your Tweets! The party starts at 8 p.m. ET and we’ll be opening the doors to greet our guests starting at 7:30 p.m. ET. To be eligible for the pre-party prize, please enter on the RSVP post. @EventBarkers will announce winners every 5-10 minutes. Be sure to follow @EventBarkers so you don’t miss out! If you win, they’ll DM you with prize details after the party. If you’ve been to any of our Event Barkers parties, you know they’re fast-paced! We use Hootsuite and open a column for the #SuperDogSunday hashtag. You might want to visit our #SuperDogSunday TweetChat room if you prefer. Once you’re there, you can Tweet from the party room and you won’t see any non-party Tweets in your stream. Here’s a look at the Twitter handles you’ll want to watch for all the action! @DogTipper @ToDogWithLove @AllThingsDog @5MinutesforFido and @RoccoHavanese — Will share tips to get your dog in the game -- activities for a dogggone good day! @ZukesPets — Will answer your Zuke’s-related questions! We hope to see you at THURSDAY'S party! Remember: even if you can’t make the party, or you’re not on Twitter, you are eligible to enter the pre-party giveaways. Good luck! We are working with Zuke's through our partnership in Event Barkers to produce the #SuperDogSunday Twitter party and share product news with our readers. Prizes will be provided and shipped by Zuke's. At To Dog With Love, we only share information we believe in. All opinions expressed herein are our own. Hope you have a fun time. Have a fabulous Friday.